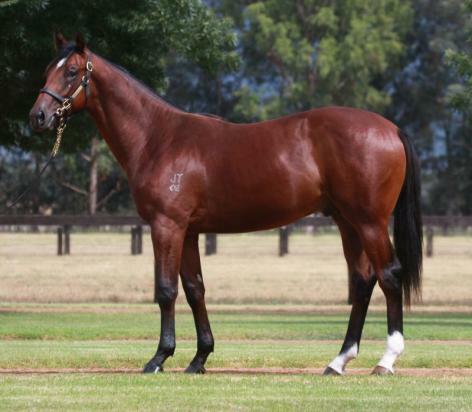 Purchased today at Inglis Easter Yearling Sale - Sydney. A lovely half brother to Bonaria, (Myer Classic winner). 50% sold ownership opportunities available. STRATUM (AUS) (Bay 2002-Stud 2006). 2 wins at 2, STC Golden Slipper S., Gr.1. Leading Aust. Sire of 2YOs 2009-10. Sire of 548 rnrs, 375 wnrs, 29 SW, inc. Crystal Lily (STC Golden Slipper S., Gr.1), Streama, Stratum Star, Southern Lord, Unpretentious, Divine Calling, Running Tall, Enquare, Takedown, Va Pensiero, Attention, I'm All the Talk, Battle Hero, Misstrum, Texan, Tawteen, Averau, Bush Aviator, Darlington Abbey, Love Rocks, Queenstown, etc. BONARIA (f. by Redoute's Choice). 8 wins-1 at 2-from 1100m to 1600m, A$951,319, to 2014-15, VRC Myer Classic, Gr.1, Schweppervescence Trophy, Gr.3-twice, MRC Mannerism S., Gr.3, VRC Lort Smith Animal Hospital H., MRC The Age H., Sportingbet H., 2d VRC Blazer S., Gr.2, MRC Ladies Day Vase, Gr.3, Geoffrey Bellmaine S., Gr.3, 3d MRC Geoffrey Bellmaine S., Gr.3, Vintage Photobooth H., VRC Peter Rowland Catering H., MRC Responsible Gambling Awareness Week H., Race-Tech 2YO H., 4th VRC Let's Elope S., Gr.2-3 times, MVRC Sunline S., Gr.2, MRC Summoned S., Gr.3, WW Cockram S., Gr.3. TIME OUT (g. by Rory's Jester). 6 wins-3 at 2-to 1200m, A$240,700, M$593,550 in Aust. and Macau, Illawarra 2YO Classic, Gr.3, NSW Tatt's RC Cabravale Diggers Members' H., Carrington S., AJC Doyles Seafood 2YO H., 2d AJC Brian Crowley S., L, Razor Sharp H., L, National Telecoms Group H., 3d STC Heritage S., L.
JOLIE BAY (Fastnet Rock). 2 wins at 1000m, 1200m, A$236,530, ATC Roman Consul S., Gr.2, 2d VRC Coolmore Stud S., Gr.1, ATC Brian Crowley S., L.
Maroon Bay. 2 wins at 1000m, 1100m, A$111,100, to 2014-15, ATC Cellarbrations H., MVRC Alternate Railway H., 2d ATC St Johns Park Bowling Club H., 3d MRC Cove Hotel H., Sportingbet Best Tote Plus 5% H., MRC (Mornington) Orbit Fitness H.
Legalistic. 2 wins-1 at 2-at 1200m, MRC Vite Cheval H., 3d SAJC Philip Bentley H.
Zara Bay. Winner at 1100m in 2015-16, ATC Tab.com.au P., 2d ATC McGrath Estate Agents H., More Than Ready at Vinery P., 3d ATC Cellarbrations 2YO P.
Carbon Taikun. 5 wins at 1000m, 1400m, A$80,320, to 2014-15, 2d ATC Fairfield 2YO P., 3d ATC Southern Educational Services P., Mercure Kooindah Waters Golf & Spa Resort H., BRC Novotel Brisbane Airport H.
Super Horse (g. by Flying Spur). 4 wins at 1400m, 1600m, HK$2,141,525, HKJC Citibank International Personal Bank H., Sea Eagle H., Jaeger-Lecoultre H., High Autonomy H., 2d HKJC Super Fit H., 3d HKJC Sunbird H., Audemars Piguet Royal Oak H., River Verdon H., Tailorbird H., Kranji H.
TESSERA (Medaglia d'Oro). 2 wins at 2, A$174,750, in 2015-16, ATC Canonbury S., Gr.3, Agribaba & Aunong.com 2YO P., 4th ATC Todman S., Gr.2. Chiaroscuro. 5 wins to 1250m to 2014-15, ATC Canterbury Park H., 2d ATC Instagram H.
Elusive Elle (f. by Elusive Quality). Winner at 1350m in Aust. Producer. Gagosian. Winner at 1200m in 2015-16, 3d Albury Guineas. Time to Exceed. 6 wins to 1100m to 2014-15, GCTC New Events Centre H.
Three Sheets. 3 wins to 1200m, A$133,100, to 2015-16, SCTC Coastline BMW X5 H., 2d GCTC Sky Racing Magic Millions Country Cup, BRC Relaxed Racing P., 3d BRC Shamrock Marketing H.